Dr. Ginzler is the newest member of the team here at Park 56 Dental, but she definitely brought skill and experience with her. She is a certified Invisalign provider with a true eye for aesthetics and arts—when she’s not busy being a dentist, she enjoys being a makeup artist! Dr. Ginzler earned her DMD from University of Medicine and Dentistry of New Jersey, which has since become Rutgers Dental School. 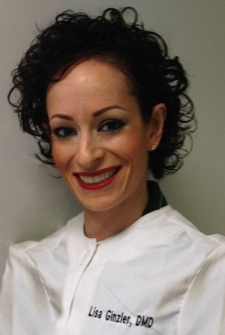 She practiced in Manhattan for eight years before joining our practice as a top dentist in NYC. She enjoys each of her patients and loves getting to know everyone. When she’s not working at the office or home, she enjoys taking in a good movie, appreciating the arts, and getting away to the mountains. If you’d like to meet or consult with Dr. Ginzler or any of the top dentists here at Park 56 Dental , just give us a call at (212) 826-2322. You can also visit us online to learn more about the services we provide, including general, cosmetic, and emergency dental services. If you’re considering Invisalign to straighten your smile, or you’ve already spoken with a top dentist and found out that you’re a good candidate, you might be wondering what life will be like once your treatment begins. The good news for you is that adjusting to life with Invisalign doesn’t take very much effort at all. In fact, after the initial couple of days of getting used to the new feeling, you probably won’t even think about your trays until it’s time to eat or brush! With traditional orthodontic options, major adjustments must be made to the oral hygiene routine in order to ensure adequate cleaning and healthy teeth. This simply isn’t true of Invisalign. The only thing you’ll have to add to your routine is a quick cleaning of your trays—less than two minutes every day. The way you brush and floss remains the same since you can literally remove your orthodontic treatment as needed and then pop it back in after! Once of the biggest inconveniences of traditional braces is the restriction on various types of food. Certain foods, such as hard or crunchy items, sticky foods like caramel, and even popcorn, can damage the hardware and make hygiene that much more difficult. With Invisalign , there are no food restrictions. None! Just transfer your trays to their case during meals and return them to your mouth when you’re done. People who enjoy contact sports and an active lifestyle often have trouble coping with braces because of the increased risk of injury from the metal brackets or the risk of damaging the appliances themselves. This is a non-issue for Invisalign wearers. You can remove your trays to wear a mouthguard if needed, and you won’t risk doing damage to the soft tissues in your mouth. You’ll want to choose a top dentist in NYC for your Invisalign treatment for best results, and at Park 56 Dental , that’s exactly what we are. Visit our website to learn more about our practice and services, or just give us a call at (212) 826-2322 to set up an appointment. If you have tooth sensitivity, you know how excruciating it can be. For some, the sensitivity can be so severe that even breathing in cold air sends the nerves into a frenzy. Sensitive teeth can cause you to avoid some of your favorite foods for fear of pain, and may even cause you to practice less than ideal oral hygiene standards. Watch this video from the ADA to learn about what causes tooth sensitivity, as well as what you can do to get it under control. Certain toothpaste products have good results, but your dentist may be able to offer more options if those don’t work well for you. For more information about this topic, or to schedule dental work with some of the best NYC dentists, contact us at Park 56 Dental . Visit our website or give us a call (212) 826-2322 for a consultation or appointment. When the top dentist in NYC recommends dental implants, you know implants must be the right choice. Once you get your new implants, you must work hard to take good care of them. While your dentist will show you exactly how to care for them, it’s important to remember the little things. Read on for tips on how to care for your dental implants. Just as you did before you got dental implants , you should brush twice a day and floss at least once a day. Even though implants don’t get cavities like natural teeth do, they still need to be cleaned; your gums need to be cared for, and you need to remove food particles and bacteria from the implants. Lack of daily cleaning can lead to gum disease and inflammation or infection around the implant. The best dentists remind you that you should see them every six months for a professional cleaning and exam. This doesn’t change once you get dental implants. Continue to schedule twice yearly appointments for cleanings and to have the dentist examine your gums and implants. Diagnostic tests are also needed to ensure the bones around the implant rod are healthy. Your dentist will determine when you need these X-rays. Proper care of dental implants include recognizing problems with the implants. Any loosening or changes in your bite should be reported to your dentist as soon as possible. The fix for that implant issue is easy, but don’t delay treatment. The problem could worsen. Let your dentist take care of the problem quickly to get you back to optimal oral health. In NYC, trust the top dentists at Park 56 Dental . Our cosmetic dentists can help you look your best, and our emergency dentists are here for you if a problem strikes. For an appointment with one of the best dentists in the city, call (212) 826-2322 today.